Do you need an RV cover? Here are a few covers for those expensive RV's. If you do not have an enclosed parking area for your RV, one of these should be on your want list. The sun and the rain can cause so much damage over time it is wise to protect your investment. You may click the images below to find the right cover for your RV. This rugged polypropylene material is water-repellent and resistant, yet it breathes to reduce mold and mildew. It is UV and mildew resistant. This cover fits campers from 8'-12' long. It has a back zippered panel for easy access to the camper door. The back panel can be held open by snaps. The elasticized back and front hems form a fast and snug fit and the full cut allows room for ladders, air conditioners and anything else. The Polypropylene in this cover allows air to circulate and is water resistant. The cover is sewn with tough interlocking seams for years of reliable service. It includes a tie down cord and storage bag. 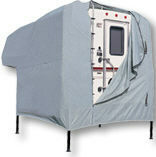 Northern Tool offers many different types and styles of covers for RV units, large and small. We have gone shopping for RV Covers at some of the best online stores and here is what we have found. Hopefully one of them will fill your needs.